My Valentine, the best Valentine's day gift ever! This sweet baby girl is my Valentine. On February 16th, I found her along with 2 of her sisters abandoned in a shed. My boyfriend, neighbor and boyfriend's brother scooped these girls up and snuggled them closely. We bathed, fed and made pallets for these pups to sleep in my warm home. After 3 weeks, I found her 2 sisters loving homes, while Valentine stayed with me. She has 2 older siblings now. Disco, a 2 1/2 year old German Shepherd/Pitbull mix, and Zinfandel, a 2 year old tuxedo cat! She loves to play with her brothers, sharing toys, and snuggling with her mama and daddy! She has been by far the best Valentine's day gift ever! 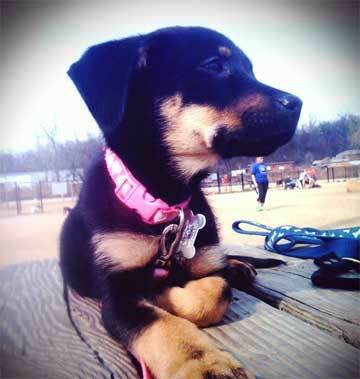 Hello Whitney, what a great German Shepherd mix puppy story. And thank you so much for sharing your great rescue story about your wonderful German Shepherd puppy mix babies. And thanks for making the rescue in the first place - if everyone could and would do that more often just imagine how many less dogs there would be in shelters all over the world. And what a wonderful picture - I absolutely love it! Too cute! And a great name too. I always love Valentines Day - one of my favorite holidays still. She is absolutely adorable. And to all our readers - now it's all up to you. Share with us as you'd like, read the stories of others, watch a few German Shepherd videos and see what experiences others have had with their own GSDs. Thanks for visiting us here at Total German Shepherd. And I'd like to take the time to say thanks to all our visitors for reading along with us. If you get the chance, please come back often to see what else is going on in our growing German Shepherd Dog community. BTW, please tell us also exactly what you think about the above story by leaving some interesting comments below. "How do I do that? ", you might ask. It's pretty easy to do - just click on the link that says "Click here to post comments" and if you want to read what others have said you can do that too at the same place. Comments for My Valentine, the best Valentine's day gift ever! It was their Lucky Day when you discover the pups in that shed. They all are sooo cute and loveable. Good Luck to everyone involve with taking the pups to give them a loving and safe home. What a Sweet gift for pups and everyone! Take care. Join in and write your own page! It's easy to do. How? Simply click here to return to GSD Mixes.